A Day Late and A Dollar Short: Subway - BOGO **FREE** for April! Subway - BOGO **FREE** for April! 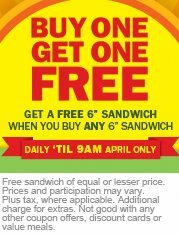 Subway is offering, for the month of April, buy one (1), get one (1) **FREE** on any 6" sandwiches! This deal is only good until 9AM though, so if you're a late riser (like some of us), this deal may not be for you. But for you early risers, this is a great deal to snag on your way into work! 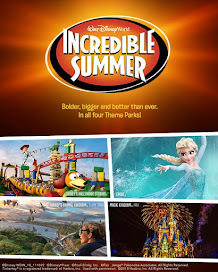 Visit the Subway facebook page for more details and information!